Area 51 has caught the imagination of generations of science fiction fans that inspired countless writers, visual artist, movie makers and now, watchmakers too. The Baden-Württemberg based GRIEB & BENZINGER was approached with an unusual request, by one of their long time clients, create an alien-themed watch for his 12-year-old son. The result is Area 51, with solid 18K palladium white gold case. Grafenau, September 2013 – It’s gotten around in the world of watches: GRIEB & BENZINGER fulfills bespoke horological dreams. 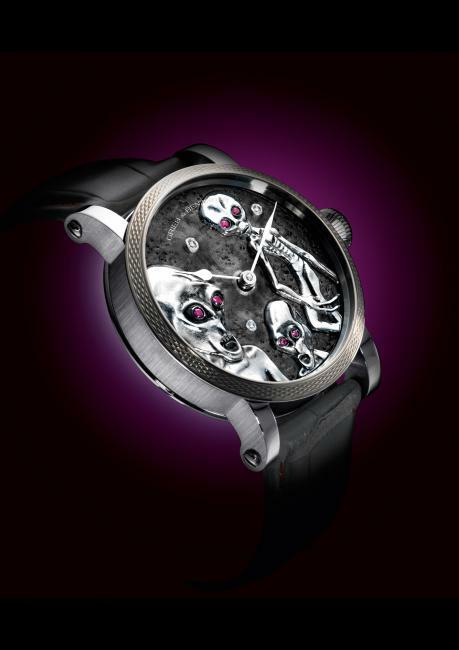 Like hardly another, the masters of skeletonization at GRIEB & BENZINGER know how to fulfill the wishes of its clients with traditional technology and exceptional design, creating a unique handmade piece with high exclusivity that allows the client to have his or her personal watch dream realized. Earlier this year, a very unusual request arrived at the workshop from a customer who already owns several GRIEB & BENZINGER timepieces. 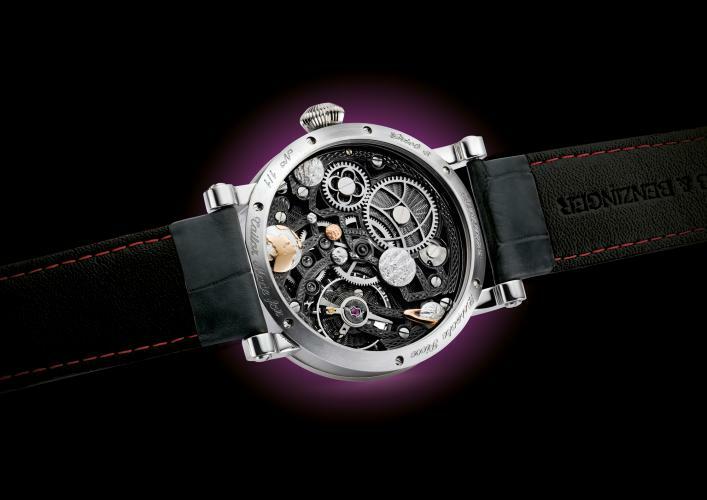 As his son is a huge fan of aliens and space, his personal wish was to receive an alien-themed watch along the lines of the Area 51 legend realized for him by use of GRIEB & BENZINGER’s famous horological techniques. Using well-known Hollywood movies featuring extraterrestrials as a model, the challenging project was realized using materials that allowed for a metalized liquid appearance. Thanks to the extreme talent of Albrecht Bolz, master goldsmith in charge of all GRIEB & BENZINGER goldsmith needs, the final result looks unusual and amazing to say the least. Three-dimensional aliens with metalized surfaces and ruby-set eyes against a backdrop of a grey moon-surface dial with craters set with diamonds open a new era of GRIEB & BENZINGER BOUTIQUE customer design. The back of the watch displays the mechanical movement with in-house modifications like all GRIEB & BENZINGER watches created in traditional craftsmanship using historical machines and tools: skeletonization, guilloché and engraving are all completed by hand to achieve an impressive movement with a great deal of character. This movement is also blackened and continues the extraterrestrial theme: three-dimensional planets – of course prominently including Mother Earth – are set on the bridges providing an impression of the depths of space. Housed in a solid 18K palladium white gold case and secured using an extra-short strap with red stitching, this Area 51 watch will ensure its future owner, a 12-year-old boy lucky to have a loving father to fulfill his horological dream, has a smile on his face. The price of the watch?… Finite, but the price of the smile is something that money cannot buy. In our original post we marked Bavaria as the home of GRIEB & BENZINGER, but they are actually based in Grafenau Baden-Württemberg and not Grafenau Bavaria. We apologize for this error.